1. Tear the pitta bread into small pieces and put in a bowl with the oat drink. Leave to soak for 5 minutes. Tip into a food processor with the garlic and blend until smooth. Add 3 tsp of the olive oil, season and blend again to combine. Turn into a small bowl. 2. Heat the remaining oil in a saucepan and fry the pepper gently for 4-5 minutes until softened and beginning to colour. Add the onion and fry for a further 4-5 minutes. Tip in the beans and 4 tbsp water. Cover and cook gently for 10 minutes. Stir in the tomatoes, tomato paste and half the basil and cook for a few minutes until the tomatoes have softened slightly. Season. 3. Transfer to shallow bowls, drizzle with the garlic sauce and scatter with the remaining basil. 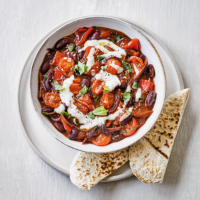 Serve with extra toasted pitta bread for something more substantial. 2 of your 5 a day; low in saturated fat.